Everyday Gyaan So Damn Thirsty? You are here: Home / Life and Inspiration / So Damn Thirsty? One simple line from Hafiz, but what imagery and such wisdom! How often we carry on doing something that just isn’t right or natural for us, pretending that we’re okay. We don’t have the courage to say ‘I’m feeling so damn thirsty.’ and get off that stupid ‘camel’. I know I’ve made this mistake often. It doesn’t mean that the job or the relationship I was in were bad. It’s just that they didn’t work for me anymore. Deep within, I knew it was time to quit. My body would give me signals too – repeated illness and allergies, but I thought I had to stay on. We’ve imbibed the notion that ‘winners never quit’ and stick on to ideas, plans, jobs, ventures, relationships that just don’t work for us. When we stay, we settle for less than we deserve. Surely we deserve to do the best for ourselves. Walking away from and quitting something we have often requires more courage than staying. We need to get off our butts, take the risk of quitting and find what works best for us. Quitting something that isn’t working is a step towards authenticity and standing up for our truth. Today, I’m reflecting on what isn’t working for me and what makes me so damn thirsty! Will you do the same for yourself? True, that ! 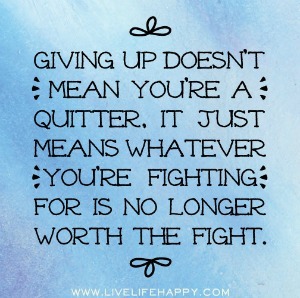 Knowing when to quit actually determines the pace of our victory , because then we are able to concentrate our efforts more on the fights that are worth it ! Stereotypes like “Only losers quit” make people stay in some really lousy situations. In fact, it takes courage to quit even though one knows one will be the object of ridicule, (false) sympathy, etc..
That’s a thought. Often we’re so busy struggling to keep up we forget to stop and think whether it’s all truly worth it. Inspiring post Corinne. Such wise words. Corrine, many go through such phases, but yes the Mantra is to push it back as hard as possible!! I love this Corrine! Quitting really has gotten such a bad name, but if it’s done thoughtfully – truly because the thing doesn’t fit and not because it’s simply too hard, it’s about letting go, moving on, and embracing possibilities. I encounter this all the time when working with people in career transition. Quitting a job (even one they hate) is so loaded, it often takes time just to feel ok with that part of the process. Thanks for your insight on this!! So true that letting go and moving on takes great courage and strength. But once done it is liberating. We normally do not quit as we associate quitting with weakness. But I’ve learnt that it’s necessary to give up something that isn’t working for me. That takes more courage. Nice post Corinne. You know Corinne, I have this wallpaper on my PC that prods me to take that leap of faith and go for what my heart really wants. But then, I realized that one reason I don’t take that leap is because that would mean I have to quit some other things that I am doing right now. I’ve had to let go of something in the past month – it was just insanity, going down the particular road I was going down. The decision didn’t make me step outside my comfort zone but I totally agree with your post. I may have to leave my comfort zone in the near future. I will try my best to make it a positive experience. It is never easy to step out of our comfort zones, but when we hunger, or in this case, thirst for something different and we can’t get that “something” out of our minds and hearts, I truly believe God is tugging at us to move forward into the unknown with faith and trust. Life should never grow stale! I’ll have a blog out in two weeks announcing that I will be going on a two-month hiatus. God is telling me to spend all my writing time on my new series of books – new adventures and new challenges, for sure, and I’m looking forward to both. This has always been a tough one for me — it’s those damn lists I make — I am forced to complete, forced to ‘make it work’ even when there is no chance it will. Thanks for the insight! As someone who spent a lot of my youth walking away from things that scared me, I find that it’s now a real art to figure out when I actually need to walk away to move forward, and when I’m walking away because I’m afraid. Thanks for a great post. Yes, the problem is what we’ve imbibed. I broke free several times, to my advantage, even if I didn’t always know it. 🙂 Today, I am happy. I am thirsty, but I have plenty to quench it! Have walked away from things in life when I feel they aren’t worth the fight. Some have been true, some have returned. Maybe shows I’ve also given up on things that are worth the fight, but that felt otherwise at a point in time. Must be careful. This was quite thought provoking and made me think about the things I have walked away from in life…and the whys. On the most part, I have had few regrets. I knew it was time to move on and I did. Quitting takes a lot of courage especially if the status quo is so deeply ingrained. You gave me something to think Corinne! I surely never considered this.. I just believed,if its not working, then I should work hard! Time to reflect on it! Quitting does require a lot of courage. But doing it for the right reasons does give you a lot of fulfillment. My list of things I need to quit is overflowing. Have to get started with quitting the things topmost on that list. Great post! I have often felt like the fish on that camel! I am learning, though. Thank you for the book recommendation. I have a big problem with refusing to quit. I have that “captain goes down with the ship” mentality. I’m so glad I found this post. I was in a dilemma and your words have soothed me 🙂 Lovely quote! That’s yet another thought provoking post from you, Corinne! Usually we think that quitting and failure are synonymous, but they are not! Knowing when to quit is very crucial, and once we know that, it works out for our best! Great quote! And your interpretation of that quote is superb too. Simple, to the point, and direct. The last sentence is perfectly put. Quitting something can indeed be a step toward authenticity. This is super-profound. There’s much to be said for setting limits for ourselves! Corinne, this is so spooky. You are a mind reader and you’ve read mine again. I’m tossing a few things over in my mind and going through the ‘quit or stay’ angst. This comes at just the right time. Thanks a million and I love the quote. Quitting isn’t a sign of failure. But continuing something though we know that it is not meant for us is wrong. Wonderful post ma’am! Brilliant quote on Quitting. Have read it many times- but honestly a bit tough to follow. I think my real test of not quitting will be this UBC – My very first attempt to blog for whole month. Brilliant post. Quitting takes courage, so true. People think it is giving up but it actually means taking charge of your life and moving on. Corinne, that was my situation a year ago – and I did listen. Sometimes quitting is the only way … everything changed for the better for me.Great blog and I love the Hafiz quote.